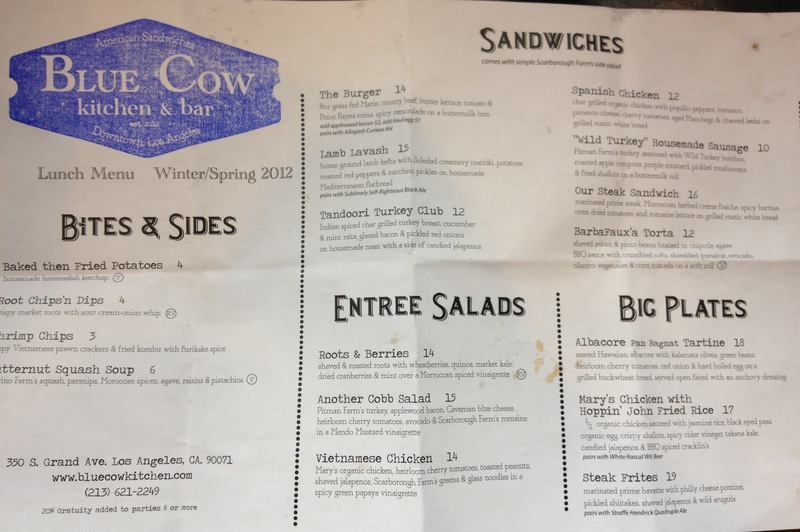 UPDATE (5:21 PM) - Looks like Blue Cow ran into a few permit setbacks. Thus, BC will now grand open on Monday, February 12 at 11:30 am. Back in October, it was announced the Mendocino Farms team would be converting their downtown Mexican eatery Casa into Blue Cow Kitchen & Bar, a (former Church & State chef) Josh Smith-led "upscale, full-service, new American restaurant, serving upscale sandwiches, seasonal cocktails, craft beers, small plates and entrees that showcase local products and artisan products." So basically, a fancier Mendocino Farms. A spin-off if you will. The "Frasier" to Mendo's "Cheers." We started with the Baked, Then Fried Potatoes -- which came with housemade horseradish ketchup and "sour cream onion-whip." Although long, these were very reminiscent of Short Order's famed Spuds. The first sandwich we ordered was Our Steak Sandwich - marinated prime steak, Moroccan herbed creme fraiche, spicy harrisa, oven dried tomatoes and romaine lettuce on grilled rustic white bread. Great sandwich, although the lack of bread girth barely could contain the awesomeness between its slices. Note to sandwich makers everywhere: YOU CAN NEVER GO WRONG WITH OVEN DRIED TOMATOES. This solid steak sandwich hammers this point home. I consider myself a chicken sandwich connoisseur and I was not disappointed with Blue Cow's Spanish Chicken - char grilled organic chicken with piquillo peppers, romesco, pimento cheese, cherry tomatoes, aged Manchego & charred leeks on grilled rustic white bread. Another great sandwich, although, like the steak sandwich, I think a thicker bread slice may be needed. Overall, a very respectable preview lunch. I look forward to returning and trying their rotating and evolving menu. Lower Level of the Two California Plaza, Bunker Hill, 350 S. Grand Ave.